Witnessing the band live opening for Attacker at Ralph’s Diner in Worcester, MA, Magic Circle have been building a cult-like following since their inception in 2011. They’ve released a single, two full-lengths and a live cassette EP during that time, setting the stage for their third album Departed Souls. This Massachusetts quintet embrace a lot of the primal, raw principles that put doom metal on the map in the 70’s/80’s, wrapping things around a strong British metal aesthetic that also penetrated the scene. You’ll hear a lot of twin rhythm activity that brings out NWOBHM riffing and interplay, often using a lower tuning which resonates in a Sabbath/Trouble-like kaleidoscope. There’s a dirty, gritty atmosphere that combined with the outer worldly warble of vocalist Brendan Radigan makes “I’ve Found My Way to Die” an early favorite – as he channels everyone from Ozzy Osbourne to Ian Anderson against a southern C.O.C.-oriented swagger. 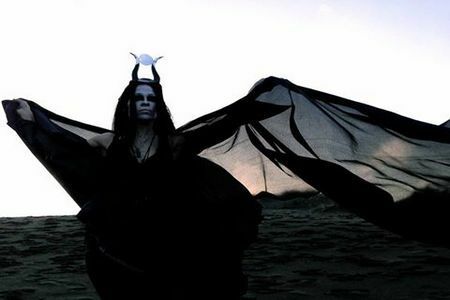 Psychedelic ambiance enters specific hooks and melodies – “Valley of the Lepers” and the calmer restrained opening for “Gone Again” two examples of setting things up as the doom riffs and bass/drum groove undercurrent elevates these songs into a hypnotic swagger. 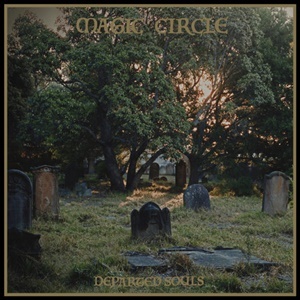 Magic Circle exudes inner strength and confidence – robust guitars that often present their own singalong nuances beyond Brendan’s majestic vocal presence, as “Nightland” illustrates through some circular dual guitar lines beyond the bigger doom passages. Backwards looping for the shorter, banjo-fueled instrumental “Bird City Blues” gives the listener a brief reprieve before the closer “Hypnotized” looms large, another Sabbath-esque effort that showcases Brendan rearing back and reaching to the sky through his sustained, higher soulful range. Considering the busy endeavors many of these members have with other projects and their lives in general, it’s always a treat to hear Magic Circle come together. Departed Souls isn’t trying to relive nostalgia from the 70’s/early 80’s – it’s just adding another textbook to the eternal legacy of metal’s longevity.